Craving for Filipino food in Portugal? 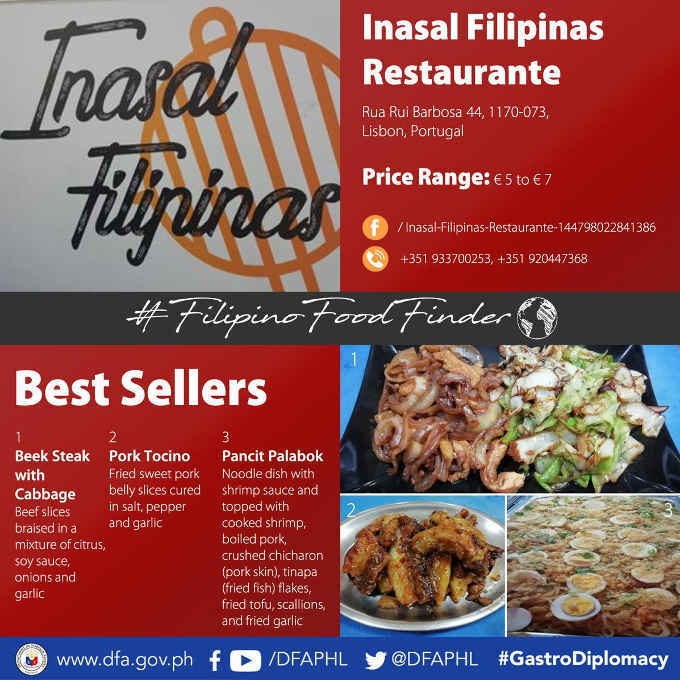 Try Beef Steak with Cabbage, Pork Tocino, and Pancit Palabok at Inasal Filipinas Restaurante in Lisbon, Portugal. The foods offered are very affordable. Prices ranges from 5 to 7 Euros. The restaurant is located at Rua Rui Barbosa nr.44 Freguesia São Vicente Lisbon, Portugal. You may call them for reservation or inquiry at +351 933 992 591, +351 933 700 253, +351 920 447 368. Inasal Filipinas Restaurante’s best sellers are Beef Steak with Cabbage braised in a mixture of citrus, soy sauce, onions, and garlic, Pork Tocino and Pancit Palabok. Filipinos and locals are encouraged to come and taste the flavors of the Philippines. The restaurant offers a warm atmosphere and lots of fun. If you want to organize a good dinner with great entertainment, book now. It opens at 9:00 AM and closes at 10:00 PM.